A HORRIBLE TIME ON TELEVISION: Horror Host poster to debut at Columbus Horrorhound Weekend! Kids from all over have grown up watching scary movies on late- nite TV. Many times the Horror Hosts that present these often no-so scary shows are a regular and anticipated friend to the young and old TV nite- owls. Today hosts such as Karlos Borloff, Dr. Destruction, and Ivonna Cadaver along with the Horror Host icons of Count Gore DeVol, Zacherley, Son of Ghoul and Svengoolie carry on the traditions started back in the 1950’s. 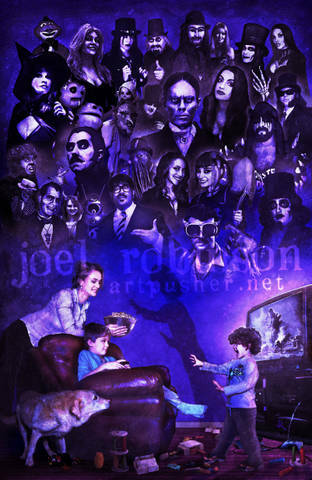 As a tribute to these zany and wacky Ghouls, a limited edition poster entitled ‘A Horrible Time on TV Tonight’ has been created by nationally renowned artist Joel Robinson who was commissioned by the Sons of Witches MC2. Kids of all ages continue to enjoy the scary, haunting and spooky fun watching these shows. They are dear to the hearts of all of Horror Hosts. As a small way of saying ‘fanxs’ the poster can be ordered on line at www.sonofwitchesmc2.com! Or at the Horror Hound convention to be held in Columbus, Ohio March 23-25, 2012. They cost $5.00 plus $3.00 s&h. A donation of $0.50 for each one purchased (until they run out) will be given to the Shriner’s Hospital for Children in Cincinnati, Ohio to help them carry on the fantastic mission of caring and healing those kids. Put some scare onto your walls! Our ‘ghoual’ is to raise $1,000.00. THX! This entry was posted in Horror Hosts. Bookmark the permalink. ← Do you remember…GRE-GORY, BIG BAD VAMPIRE BAT?